You can create a package for your presentation and save it to a CD or USB drive so that other people can watch your presentation on most any computer. Some folks may call this "publish a presentation to a file." Insert a blank recordable CD (CD-R), a blank rewritable CD (CD-RW), or a CD-RW (that contains existing content that can be overwritten) in the disk drive. In PowerPoint, click File, click Export, click Package Presentation for CD, and then click Package for CD. In the Package for CD dialog box, type a name for your CD in the Name the CD box. To add one or more presentations to package together, click Add, select the presentation, and then click Add. Repeat this step for each presentation that you want to add. Tip: If you add more than one presentation, they'll play in the order in which they are listed in the Files to be copied list. Use the arrow buttons on the left side of the dialog box to re-order the list of presentations. To include supplementary files such as TrueType fonts or linked files, click Options. To inspect your presentation for hidden data and personal information, select the Inspect presentation for inappropriate or private information check box. In the Package for CD dialog box, click Copy to CD. Note: To save your presentation to a DVD, see Burn your presentation to a DVD. Insert a USB flash drive in a USB slot in your computer. In the Package for CD dialog box, click Copy to Folder. In the Copy to Folder dialog box, select Browse. In the Choose Location dialog box, navigate to your USB flash drive, select it or a subfolder in it, and then click Select. The folder and path you chose are added to the Location box in the Copy to Folder dialog box. PowerPoint asks you a question regarding linked files. It is best to answer Yes to ensure that all necessary files for the presentation are included in the package that is saved to the USB flash drive. PowerPoint begins copying files, and when it is done it opens a window showing the complete package on the USB flash drive. To save your presentation to a DVD, see Burn your presentation to a DVD. Open the presentation that you want to copy, or, if you are working with a new presentation that has not been saved, save the presentation. If you want to save your presentation to a CD, rather than to a network or to a local disk drive on your computer, insert a CD into the CD drive. You can copy to a blank recordable CD (CD-R), a blank rewritable CD (CD-RW), or a CD-RW that contains existing content that can be overwritten. In PowerPoint, if you copy your presentation to a CD, make sure that you copy all of the files in a single operation. After the first set of files is copied, you cannot add any more files to the disc by using PowerPoint. However, you can use Windows Explorer to copy additional files to a CD-R or CD-RW that contains existing files. See Windows Help for more details. Click Save & Send, click Package Presentation for CD, and then in the right pane, click Package for CD. To add a presentation, in the Package for CD dialog box, click Add, and then in the Add Files dialog box, select the presentation that you want to add and click Add. Repeat this step for each presentation that you want to add. Repeat this step also if you want to add other related, non-PowerPoint files to the package. Note: The presentation that is currently open automatically appears in the Files to be copied list. Files that you linked to the presentation are included automatically, but they do not appear in the Files to be copied list. If you add more than one presentation, the presentations will appear on a Web page that lets you navigate to the contents of the CD in the order in which they are listed in the Files to be copied list in the Package for CD dialog box. To change the order, select a presentation that you want to move, and then click the arrow buttons to move the presentation up or down in the list. To remove a presentation or file from the Files to be copied list, select the presentation or file, and then click Remove. To ensure that files that are linked to your presentation are included in the package, select the Linked files check box. Files that are linked to your presentation can include Microsoft Office Excel worksheets that are linked to charts, sound files, movie clips, and more. If your presentation does not currently include embedded fonts, checking the Embedded TrueType fonts check box includes the fonts when packaged. 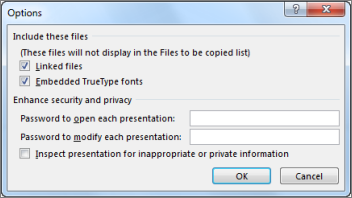 The Embedded TrueType fonts check box applies to all presentations that are copied, including linked ones. If your presentation already includes embedded fonts, PowerPoint automatically honors the setting of the presentation to include the embedded fonts. To require other users to supply a password before they can open or edit any of the copied presentations, under Enhance security and privacy, type the password or passwords that you want to require to open the presentation, edit it, or both. Passwords apply to .pptx, .ppt, .potx, .pot, .ppsx, .pps, .pptm, .ppa, .ppam, .mhtml, and .mht files that have been converted to .ppt files, in the copied presentations. If any of the files that you copy already have passwords assigned to them, PowerPoint prompts you to choose between keeping the previously assigned passwords for those files and overriding them with the new passwords. If you choose to override the previously assigned passwords, they are no longer accepted for the copied versions of the files. However, they are still accepted for the original versions. If you are copying your presentation to a network or to a local disk drive on your computer, click Copy to Folder, enter a folder name and location, and then click OK. 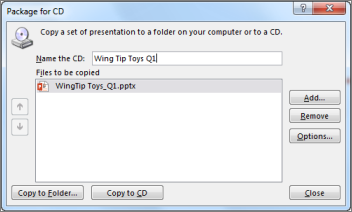 If you are copying your presentation to a CD, click Copy to CD. Insert a USB flash drive into a USB port of the computer. Click the Microsoft Office Button , point to Publish, and then click Package for CD. In the Package for CD dialog box, click Options, and then select the options that you want. Click Copy to Folder or Copy to CD. PowerPoint packages your presentation to the folder or CD so that you can distribute it. PowerPoint Viewer 2007 does not support files that are formatted for PowerPoint 97 or earlier. To use PowerPoint Viewer 2007 to view a presentation that is formatted for PowerPoint 97 or earlier, open the presentation in PowerPoint 2000, 2002, or 2003 or later, and then save it in a format for PowerPoint 2000, 2002, or 2003 or later. You can run PowerPoint Viewer 2007 on Microsoft Windows XP Service Pack 2 or later. To specify how a presentation will play in the PowerPoint Viewer, click Viewer Package (update file formats to run in PowerPoint Viewer), and then select an option in the Select how presentations will play in the viewer list. To make a package that you are certain viewers will view on a computer that has PowerPoint or PowerPoint Viewer installed, click Archive Package (do not update file formats). PowerPoint for macOS doesn't offer a "package presentation for CD" feature. In PowerPoint for macOS, all content is embedded by default. So if you insert a sound, picture, or video, a copy of that media file is included within the PowerPoint file. The "Package for CD" feature is unnecessary, since you already have the content in the PowerPoint file.